We followed the Ford Explorer closely, not wanting to get lost in this mountain community we didn’t know. After driving for two or three miles on the ridge top road, we took a right turn onto a rough dirt road. Dirt? I hadn’t expected that. Wouldn’t the car get all dusty and dirty? Yuck. Growing up in the suburbs of St. Louis, Missouri, I was used to prim and proper neighborhoods. You now the kind. Lawns meticulously cared for, with nary a dandelion. Perfectly pruned hedges, with nice square lots of about .5 acre. Mailboxes in front of each house. Five or six type of model homes that repeated themselves every so often. Cookie cutter style. But the cars were always clean. 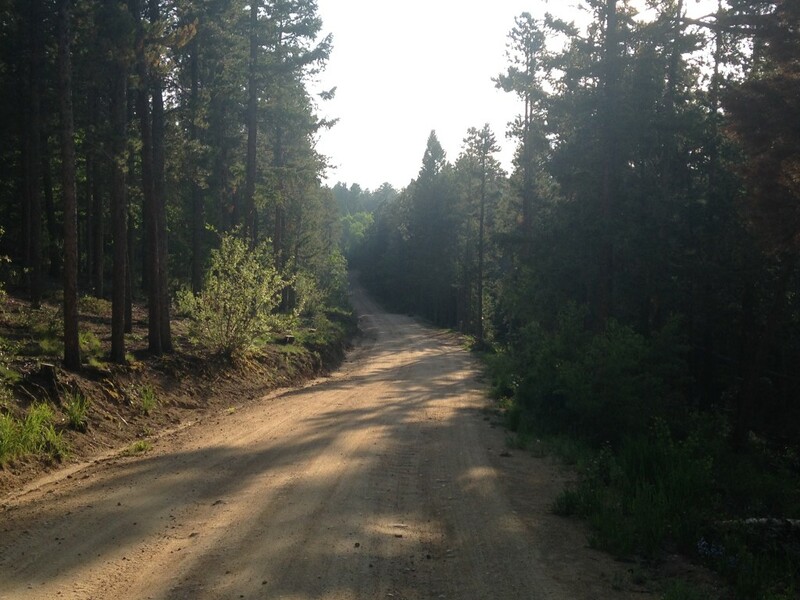 We bumped along on this dirt road for about 1.5 miles before turning onto another dirt road. A car driving the other way suddenly made me realize this road was only one lane wide. We searched for a small turn out to pull out as the Subaru went by us, stirring up a cloud of dust. Then we pulled into the (what else?) a dirt driveway behind our realtor’s car. There it was, a simple basic log home. It didn’t look like much from the outside, but as soon as I walked in the door, I knew it was home. The exposed logs, the cathedral ceilings, the skylights, and the big windows allowing beams of sunlight to stream through. The views of the mountains from the back deck. The fresh mountain air that smelled like pine trees. This was everything I had envisioned when I dreamed of a home in the mountains. And so it was, that three months later, we found ourselves driving those same dirt roads to move in and make this place our home. Those same dirt roads that I had so eschewed as a suburban girl growing up, I have grown to love and embrace. But for those coming from city and suburban environments, old habits can die hard. The dirt road we live off is actually private. It isn’t maintained by the state or the county, but rather by a guy that the residents of this neighborhood pay through our HOA dues. Most people think of HOAs as fancy gated communities with fancy people living in fancy homes. Our HOA helps us maintain our dirt roads, grading them periodically before the potholes and ruts become big enough to do serious damage to the car. Or to plow the roads after a big snowstorm, so we can actually get to work. Because the dirt roads can feel more like trails in our secluded, wooded neighborhood, we tend to walk down them as if they are trails. On any given day, people walk by with their dogs (or not), enjoying the fresh air, the flowers, the trees, or the newly fallen snow. Our roads have no asphalt, no stripes, no center stripe and no shoulders. So we all just walk, sometimes in the middle, sometime to the side, sometimes congregating in the middle in a group, chatting, with a soiree of dogs around us frolicking hither and yon. Those of us who have lived here long know and appreciate this about living here. But city dwellers who have recently located or service people, or visitors don’t know. They think they are still living in the city, and often try to drive that way, whizzing along at a breakneck pace. There have been many times I have been out walking when I feared I was about to get run over by one of these unruly and unwelcome drivers. I wave my arms, in a failed attempt to get them to slow down. I resent this people. This is our home, and they are invading it, bring their city ways with them. Don’t they know that people, children and dogs are walking along here? If you are one of those newbies, or visitors, or delivery people, please remember, life is slower up here. We aren’t city people, rushing around, determined to run people over in our quest to get from Point A to Point B. Tread lightly, drive slowly and be aware of the folks enjoying a walk in the road. You might even take a breath and learn to enjoy the beauty and pace of life here as well.